A great relationship is one of the finest things life can offer. But lasting happiness seems hard to achieve. Sadly, too many couples get weighted down by unresolved difficulties. Walls may build over time. Good feelings can seem to get lost. Couples who stay happy have the tools to keep love and good feelings alive — even through the tests of time. There are specific key tools to keep a relationship strong, healthy and happy. And these key tools can be learned. 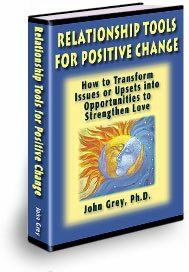 Relationship Tools for Positive Change shows you how to create a powerful shared vision with your partner — how to heal old baggage that holds you back — how to deal with upset or difficult feelings — and how to build lasting satisfaction together. This book guides you in how to effectively address differences and resolve issues. It gives you communication tools to express yourself well and to stop poor, destructive communication. You will get powerful tools to keep love, trust and happiness alive. Tools to resolve issues and stay on a positive track. These key tools are essential if you want a truly rewarding partnership. Relationship Tools for Positive Change is a 248-page illustrated and entertaining e-Book. We are confident you’ll benefit from this book filled with powerful tools and guidance to make positive changes. Download the e-Book now with a 100% Money Back Guarantee and you can start reading and gaining from it immediately. What takes us from the highs of love to the lows of upsets and problems? How do satisfied couples solve issues and keep their relationship strong? • Discover seven blind spots that subconsciously cause problems to grow larger. • Learn what really blocks couples from solving problems and makes them upset. • Find out seven key approaches to resolve issues, instead of making them worse. • Gain a new approach to dealing with difficulties that will actually strengthen love. Differences attract. But couples get into conflict over differences. How can couples resolve differences and learn to work together? • Understand the ten ways most couples blindly get stuck in struggles over differences. • Get beyond the destructive grip of these ten common relationship traps. • Learn the only strategy that will get you new results when things are not working. • Discover seven specific ways to act differently and turn power struggles around. from damaging a relationship with poor communication. • Learn a tool to stop poor communication that makes things worse and hurts love. • Put a halt to the five destructive communication mistakes that lead to breakups. • Discover how to prevent emotional reactions, and stop saying things you later regret. • Make a powerful new agreement that keeps you from triggering upset feelings. Good communication is a key ingredient to keep love and happiness strong. Learn a powerful tool to get positive results when you communicate. • Understand the key factors that help you be a resourceful, good communicator. • Gain practical tools to communicate successfully, even about charged issues. • How to get your viewpoint heard, make effective requests, set healthy boundaries. • Go beyond upsets, defensiveness or withdrawal — be a proactive communicator. • Discover your personality type, its blind spots that limit you and your relationships. • Understand how to expand beyond personality limits, get free of past conditioning. • Learn a powerful tool to center, to stay calm, strong and creative in any situation. • Gain confidence in dealing with difficult feelings in yourself or in your partner. • Release emotional patterns and old baggage that block the flow of good feelings. • Create a shared vision that “weather proofs” your relationship in stressful times.